Being the blog of Brenden Preece. Why Sweet Thursday? - I like the ring of it, it was a folk club we had years ago, and of course it is a novel by John Steinbeck. Originally uploaded by Brenden Preece. I have just finished reading Alan Garner’s latest novel, Thursbitch. I was already aware that, like most of Garner’s other books, it was set in Cheshire. I was delighted to discover however that I actually knew some of the locations very well. For instance the opening lines of the book describe the road on which I drive into work each morning. More than any other author I know, Garner’s books are deeply filled with a sense of place. “HERE JOHN TURNER WAS CAST AWAY IN A HEAVY SNOW STORM IN THE NIGHT IN OR ABOUT THE YEAR 1755 “ The rear of the stone reads “THE PRINT OF A WOMAN'S SHOE WAS FOUND BY HIS SIDE IN THE SNOW WERE (sic) HE LAY DEAD “ and herein lies the mystery at the heart of the story. The book seemed as though it was going to be a challenging read when I first started it. This was due to the rich Cheshire dialect used in the dialogue of the 'past' part of the story. It reminded me of how my father used to speak. I met words like “raunging and skriking” that I have not heard for many years(Incidentally these two words were in widespread use Medieval English) However with a bit of perseverance I soon became deeply involved. In this short novel Garner calls on wide ranging topics such as mythology, geology, land ownership, psychedelic mushrooms and the trauma of terminal illness. Although not necessary for the enjoyment of the novel, if the reader wants to take things further, there is plenty of scope for further background research into these issues.To find out more go to the Unofficial Alan Garner homepage (see link) and follow the link to Thursbitch Tangents. I would recommend anyone to read this book. It may baffle you, it may unsettle you, it may give you nightmares but I’ll bet you will want to read it again. I certainly will. I tend to read biographies these days as I find i can dip into them after a long absence and they still make sense. I can't remeber the last novel I read all the way through. It was probably Harry Potter , that my son lent me after he's read it. Actually my partner Hazel read it too him when he was about 8. Now he's 12 he reads his own books and still likes those fantasy worlds and is reading a trilogy called The Edge Chronicles by Paul Stewart and Chris Riddell. It seems to have ripped off Tolkien but then again I think so many people have ! Living in Cheshire though I would probably find this story very interesting. Thanks for popping over to my blog Bren. I thought I'd do the same! 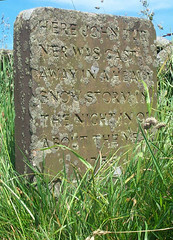 I found your blog when searching for a photo of the John Turner memorial stone. Completely agree with you, "Thursbitch" is a haunting novel, recounting a dreadful event. Garner's language is beautiful to read. I now live in Switzerland, but grew up in and around Rainow. Thursbitch valley, even in the 1960's and 1970's considered to be an evil place, especially by my older relatives. My childhood neighbour was an elderly gentleman who wouldn't even look at Jenkin Chapel! A thoroughly good read which I would recommend to anyone. Fascinating stuff. I'm just starting my third read of Thursbitch (*very* unusual: it's so rare for me to read a book more than once, but Thursbitch has caught my imagination more than any other). I'm hoping to take a hike around the area some time soon (and perhaps even camp in the valley itself) - hope that I can track down the memorial stone.